Patients can be unaware of glaucoma’s presence until they lose their eyesight. Primary care physicians can play a critical role in circumventing vision loss. Glaucoma encompasses a group of eye conditions that result in damage to the optic nerve. It’s the second most common cause of blindness in the United States. Glaucoma is incurable, and vision lost to glaucoma cannot be restored. It’s estimated that more than 2.2 million Americans have glaucoma, but only about one-half of them are aware of it. Once vision is lost through glaucoma, it can’t be regained. However, further vision loss can be prevented. And fortunately, there’s more good news in the form of new treatments on the horizon. In fact, amazing advances in medicine have already been made. The key is getting more patients to visit their eye doctors and monitoring patients’ compliance with a treatment plan to protect their eyesight. 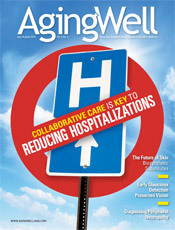 Geriatricians and primary care physicians can play a critical role in this area. Glaucoma is a condition of increased pressure within the eyeball that can damage the optic nerve and cause gradual vision loss. When intraocular pressure (IOP) becomes elevated, a patient is at a higher risk of developing the disease. But glaucoma is a complicated disease, and elevated IOP alone does not cause it. Other risk factors include a suspicious optic nerve as well as a genetic component. In recent years, glaucoma research has made enormous strides, yet many Americans still experience significant vision loss or even blindness, largely due to noncompliance issues or a simple lack of prevention. According to the World Health Organization, glaucoma is the second leading cause of blindness in the world. It can strike anyone—from children to the elderly—though age does appear to be a risk factor. In addition, black Americans are six to eight times more likely to be diagnosed with glaucoma than white Americans. Once glaucoma is diagnosed, medication or surgery may be the next option. In the past, the medications used to treat glaucoma have been eye drops that require administration three or four times per day. Physicians have found patients to be largely noncompliant with such medications. That solution may be on the horizon. “We have a number of compounds that lower eye pressure very well, but the problem is that patients aren’t taking them,” Cioffi says. A solution to the noncompliance dilemma may lie in the form of injectable medication, which has been called the next big advance in glaucoma research. “Injectable medication may be the solution to noncompliance,” he says. When medication fails, laser procedures or surgery offer other options. Lasers focus internally on the drain of the eye where the fluid flows out. Laser trabeculoplasty is the procedure commonly performed and can typically be done in the physician’s office. With no cutting, the risk of bleeding and infection is eliminated. Katz was involved in a study to determine the differences in visual fields following laser trabeculoplasty vs. the use of topical medication, which was published in the American Journal of Ophthalmology. Findings indicated that for the first year, the results were equal, assuming the patient remained compliant with medication usage. In the traditional “cutting surgery,” called a trabeculectomy, the surgeon creates a sclerostomy, which is a passage in the sclera for draining excess eye fluid. A flap that allows fluid to escape from the eye is also created, and the surgeon may also remove a small piece of the iris so that fluid can flow backward into the eye. In a trabeculectomy, a small bubble called a bleb is formed. It’s a good sign, as it shows that fluid is draining, yet the bleb also poses risk for infection or other complications, says Mansberger. But even before such specialized monitoring becomes available for high-risk patients or those in the early stages of the disease, there are things patients can do now. First and foremost, timely eye exams are critical. Providers should encourage their patients to have their eyes checked regularly. Another important consideration is limiting steroid prescriptions, or at least educating patients on the link between steroids and glaucoma. For any patient, a diagnosis of glaucoma is incredibly intimidating, but diligence can pay off in terms of catching and treating the condition early. And with today’s advances in medicine, the outcomes are extremely favorable. Cioffi reminds primary care physicians that by taking this condition seriously, they can play a critical role in their patients’ outcome. As reported previously in Aging Well, experts expect telemedicine to be a key aspect of the future of medicine. Utilizing the latest technology, telemedicine describes any form of medical care delivered via communication lines using media such as the telephone, Internet, or video conferencing. Now telemedicine is being used in the detection of eye disease. Providers receive reimbursement for offering the photo service in their offices so there are few financial barriers. But physicians who are already pressed for time will need to figure out how to fit another service into their offerings. Mansberger says the rest is easy.